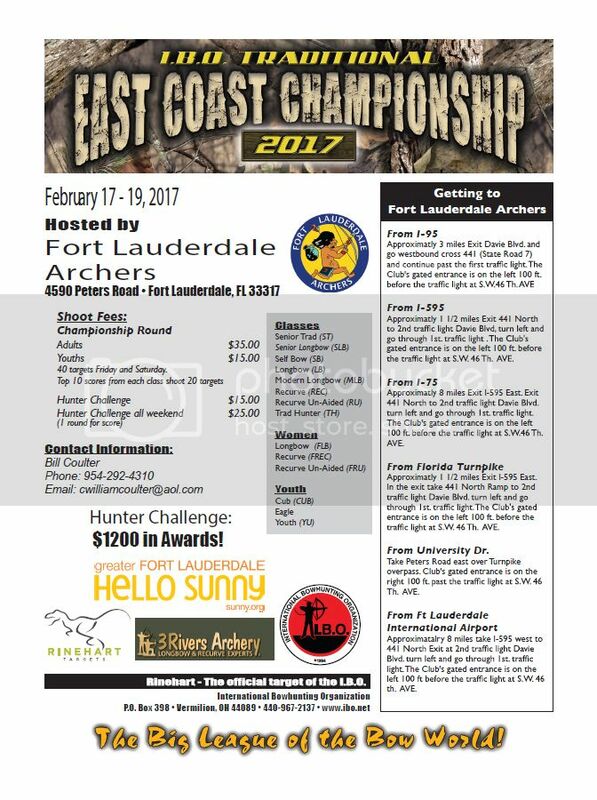 Will be held at Fort Lauderdale Archers February 17-18-19. Championship Round 40 targets Friday and Saturday. Top 10 shooters from each class will shoot 20 targets Sunday morning for 1st, 2nd, and 3rd place in each class. Hunter Challenge 20 targets, sponsored by 3 Rivers Archery $1,200.00 in awards. Saturday afternoon top 12 women, 12 men white stake, and 12 men orange stake will shoot down match play for 1st and 2nd in each group. The three winners will shoot down for 1st and 2nd overall. You do not have to be a IBO member to shoot this event. For more information go to www.ibo.net. This will be our second year hosting the IBO Traditional East Coast shoot. This time around will we have more archers and vendors. I hope everyone can make it. If you plan to come it is best to book your rooms quickly through Expedia or other online sites. Below if the range address and contact info.